I want to tackle a problem that most people think of having been solved a long time ago. 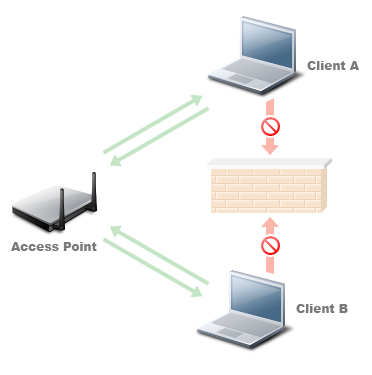 Rogue Access Points (I can almost hear the groans). Seriously, it deserves another look. Why? Well, to be truthful, I think when trying to track down and physically remove the AP, most people do it wrong. While almost every infrastructure vendor has a method for the determination and mitigation of an unauthorized access point, what they cannot do is physically remove the device from your premises. No WLAN WIPS robot has yet been created to go out to a facility and track down exactly where a rogue is and then pick it up and deposit it in a dumpster or ask the owner to please take it home or whatever it is your security policy says you should do when one of these is found. Instead, we rely on both our infrastructure and a variety of laptop or handheld based software tools to assist us in this task and then we send a real flesh and blood person out to do this. This is where the major mistakes are usually made. Every person I have met that has this task as one their responsibilities have told me the following, “I want to use a wifi adapter with a directional antenna to find the device. Just point it and it will tell me where to go.” This is wrong. Let me say that again, WRONG! 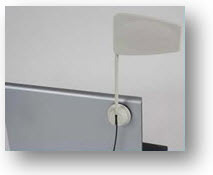 Let’s take one of the “flag” antennas that are fairly popular now (fig. 1). Inside the plastic shell of this device is a Yagi-Uda antenna, commonly called a “yagi”. This is a fancy name for the type of antenna that televisions used to use before cable and satellite. 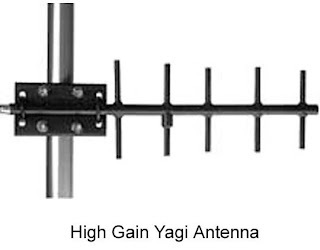 Here is an example of what a yagi looks like without a shell (Fig. 2). Antennas professionals use a pattern diagram to describe the sensitivity pattern for the antenna. The diagram shows a pattern view from above and from the side (Fig. 3). The left view is looking down on the antenna from above known as the azimuth view and the right view is from the side and is known as the elevation view. This illustrates the amount of gain this antenna gets in any particular direction. 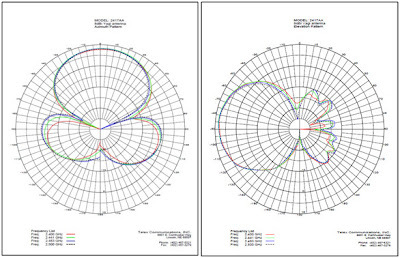 The problem here is when you start to use a high gain (in this case 8dBi) antenna indoors you get some strange effects due to the lobes described by the diagram above. Here is an example. You are determined to remove a Rogue AP physically from your building. 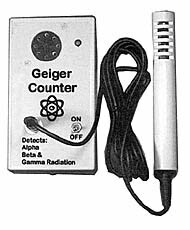 You stand in the building and aim your antenna. As you sweep left and right you watch the signal strength of your rogue finding tool. 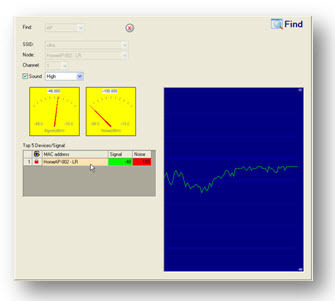 In this case we will use the find tool in the AirMagnet Wi-Fi Analyzer (Fig. 4). 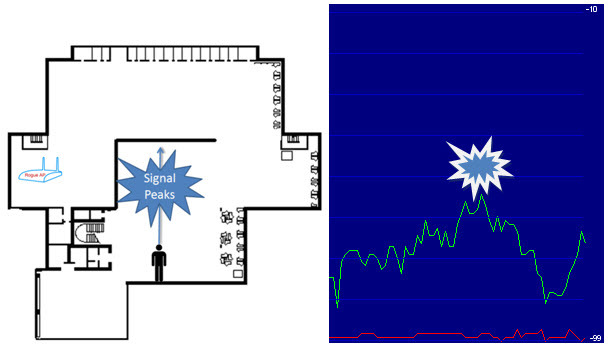 You monitor the signal strength and figure that when you are aiming right at the AP it will be the strongest. The graph will be at a peak and the meter will show the highest signal strength. However the signal is herky-jerky and very difficult to know when you are aiming right at the Rogue. Sometimes it is high when you are way over to the right and sometimes it is just as high when you are pointing to the left. Why is that? Shouldn’t it just be obvious when you have the device in your sights? No. Let me show you why. As you aim your directional antenna the gain field of the antenna sweeps out ahead of you and you get a high reading as expected when pointing right at it (Fig. 5). Then as you sweep away to the right the signal drops when you hit the gap between the primary and secondary lobe (Fig. 6). Then the signal jumps up again as you enter the second lobe (Fig. 7). 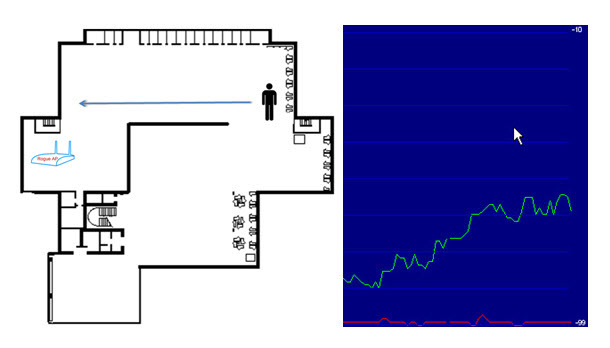 Also it may jump again as the signal bounces off of the walls and reflect back towards you (Fig. 8) since when you aim directly at the Rogue AP the signal is attenuated by the internal walls but the signal reflected back to you is clear. You see the directional antenna with a very high gain can be fooled. A user may spend 20 minutes trying to track down this device sweeping left and right trying to find the correct direction. There is a better way. I will show you how to find a Rogue AP in just a minute or two and as a bonus you get some great exercise as well. The key here, counter-intuitively, is to use an omnidirectional antenna and walk very fast. The technique is quick and accurate. You will find the rogue in less than a minute, whereas with the previous method it may take many minutes or more. The first step is to stand at the edge of the building and walk perpendicular to the wall. It is very important that you walk fast as the graph you will be watching will be jiggling around and you will need to be able to observe a distinct change to the graph which will be easier the faster you walk. Keep your eye on that graph and when it peaks and starts to decline, stop and back up to the area where it peaked (Fig. 9). Now turn 90° to either the right or left and start walking that direction quickly as well. 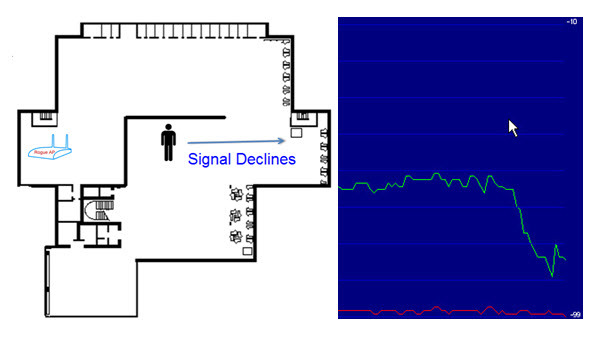 If your signal immediately declines, reverse your course and walk the other direction (Fig. 10). Once again, when the signal peaks and starts to decline, turn 90° and walk quickly. In this way, you will box in on your objective and be able to walk right up to it and remove it (Fig. 11). I think once you have tried this method you will be extremely pleased with the result. 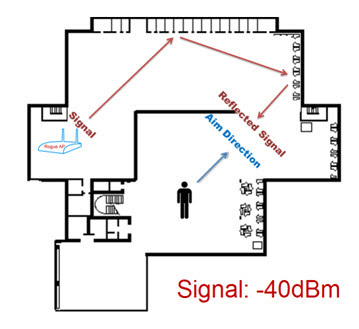 If you have tried to use a directional antenna to find a Rogue AP in the past, you will know that you can spend quite a great deal of time aiming your antenna before you even try to move towards the device. Then when do start to move around the results are hard to determine and you tend to move slowly and carefully. This method that I have described is fast and efficient and enables you to quickly find your problem Rogue AP. Our AirMagnet class instructor has taught over 5000 students how to use this method and it really is more efficient. Try it out and let me know what you think.